From awe-inspiring buildings and life-changing technological innovations to the most terrible engineering disasters of our time, MODERN MARVELS goes behind the scenes of the world s most spectacular creations and its biggest failures. In this 14-disc set, the acclaimed series examines history from every conceivable angle, from the designers behind the world s architectural masterpieces and the biggest engineering failures to greatest inventions and the worst disasters. 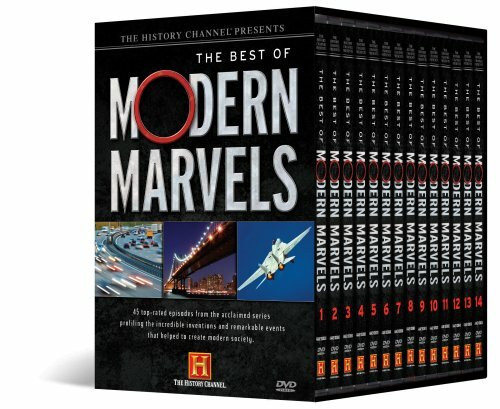 MODERN MARVELS profiles these amazing historic turning points through interviews with the builders and dreamers who created high-tech devices and man-made wonders and exclusive archive footage to analyze what has gone wrong and what s held up over the ages. This gripping collection takes an incisive look at the catastrophic failures that stunned the world--from the Union Carbide explosion to Hurricane Katrina. These programs also pay homage to the pinnacles of human achievement, from the Chrysler Building to the Akashi-Kaikyo Bridge. Celebrating ingenuity on a grand scale and accepting failures as stepping stones to a brighter future, MODERN MARVELS offers an exciting look at invention and imagination brought to life. If you have any questions about this product by A&E Home Video (New REleaset), contact us by completing and submitting the form below. If you are looking for a specif part number, please include it with your message.